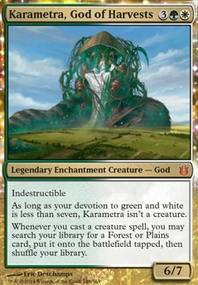 Will creature tokens trigger Karametra, God of Harvests? 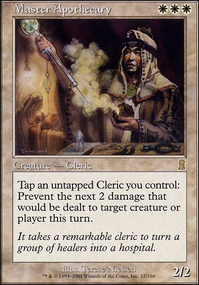 : Put a 2/1 white Cleric enchantment creature token onto the battlefield. 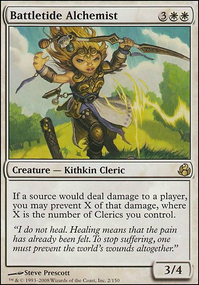 Could also maybe squeeze in a Heliod, God of the Sun to help speed up the beatdown..? 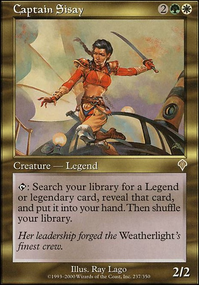 Moved Kemba, Kha Regent , Balan, Wandering Knight , & Masterwork of Ingenuity to the sideboard. Removed Danitha Capashen, Paragon & one Plains. Added Heliod, God of the Sun , Linvala, Keeper of Silence , Brightling , Sram, Senior Edificer , and Skullclamp to mainboard. Added Phyrexian Revoker to sideboard. 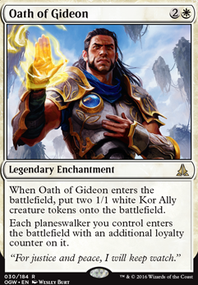 I assume you meant this to be a modern deck, if so a few recommendations; look into Herald of War and Heliod, God of the Sun . They are great at getting the angels out there and keep them out there. 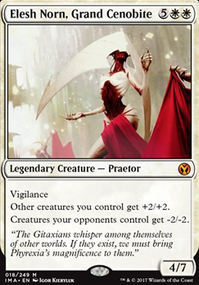 Second recommendation is to lower you cmc curve or at least add in a card like Mana Tithe or Path to Exile to remove threats early on. 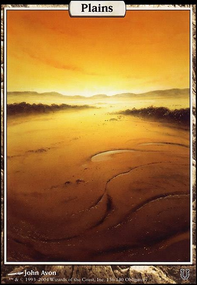 Third recommendation is to add more land, you have a few cards that are seven and above so you need to be laying down a land each turn. Deck looks like it would be great fun to play, hope it brings you many wins. I think I know the answers but I just want to make sure. 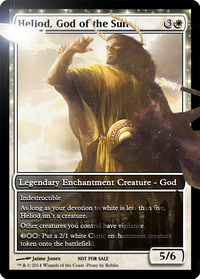 1 - If I control a theros's god like Heliod, God of the Sun (And he is a creature in my control) and my opponent steals him with Control Magic , or something like that. 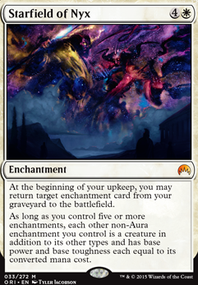 Will heliod become a enchantment without if my opponent don't have the devotion and return to me? 2 - Is there anyway of my opponent just "steal" my Gods permanently? Even with Homeward Path in the battlefield? 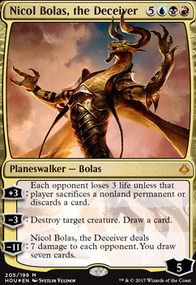 Heliod, God of the Sun and Erebos, God of the Dead would be sick in your deck, especially since they are creatures AND enchantments. 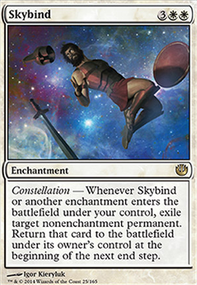 Heliod is great because of his ability to create enchantment creature tokens. 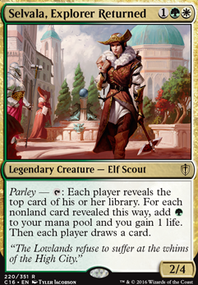 Erebos is great because it stops opponents from using any kind of life gain, and paying 2 life for card draw is pretty darn good. 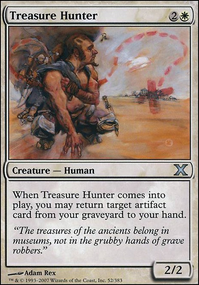 Both of these guys are also indestructible, as enchantments and as creatures. 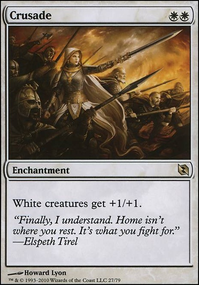 They are also big beatdown dudes, who have reasonable (in this particular format) converted mana costs. hydrothermia on Isamaru, the Good Doggo! @TheRedGoat I really appreciate the input. 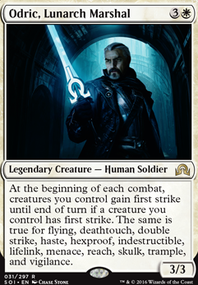 This has given me some other cards to consider that could possibly streamline this a bit more. 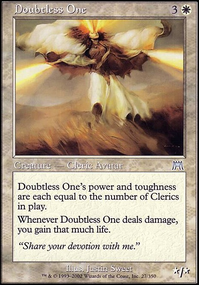 I was originally trying to make some sort of blink combo with Call for Unity so I didn't have to rely on creature destruction or exile. By telling me this gives me a better understanding of the card. I'm really bad about trying to find "hard control", I'm still used to pre-8th Edition control, compared to the more "soft control" that happens in the current state of the game. 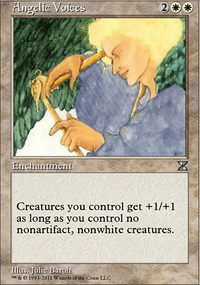 Revitalize over Blessed Alliance for the card draw, if it can be put on a stick. 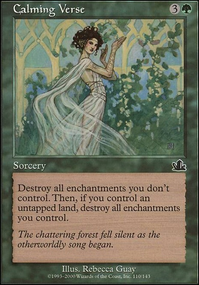 Sigil of the New Dawn should be put back into deck in the event of board wipes as well as Call for Unity . 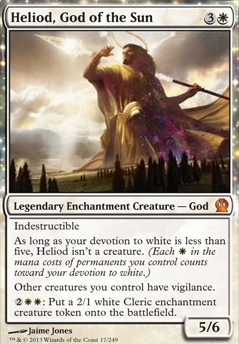 Bringing back Heliod, God of the Sun might not be a bad idea for the tokens and it synergies well with Sphere of Safety . 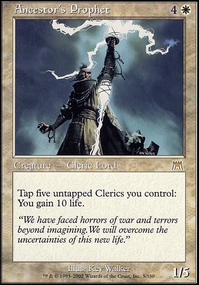 Monastery Mentor and Leonin Warleader are other viable options due to Mentor of the Meek 's trigger allowing more card draw if mana is available.